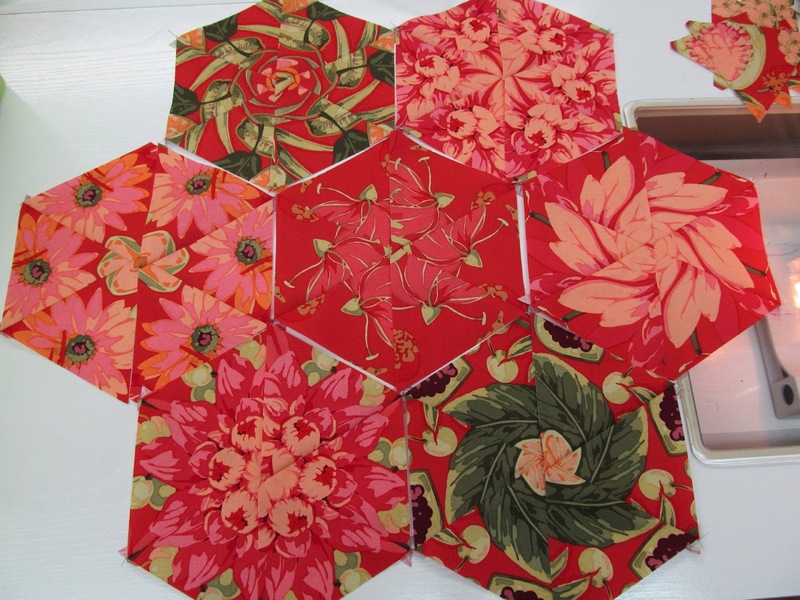 I make a little progress most days on the red OBW blocks. I had other things that needed to be done yesterday and then I had to get out the vacuum cleaner for the kitchen floor......it was in serious need of vacuuming and I tend to ignore it most days. 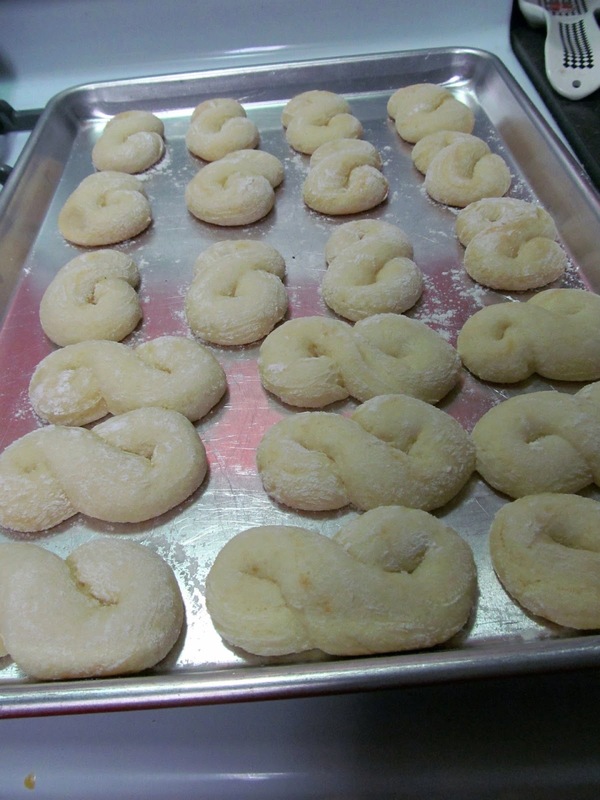 Family from out of state are in town so I needed to mix a batch of Kringlas for their visit this morning. The still early darkness is making long evenings, even longer nights for sleep, leisurely mornings for us retirees, comforting ourselves with food and hot drinks all the while. Sort of housebound but in reality not. This winter seems to be going on long without a break, not giving us any hint of an end in sight just yet. A Sunday snowy world outside my bedroom this morning. We are experiencing a double whammy weather event. A snowstorm from the south, the U.S., and a frigid air mass from the north meeting right here so we have two warnings...extreme cold coupled with snowfall. It meant on our walk today we were bundled up like Arctic explorers and the snow was up to Murphy's belly. It was more of a slog than a walk and we had to cut it short actually for her and Hubby. Lots of snow clearing to come. Why must you always be doing something? Hubby asks me. I didn't get home from shopping until 2 p.m. I think I'm all done now...I hope anyway. 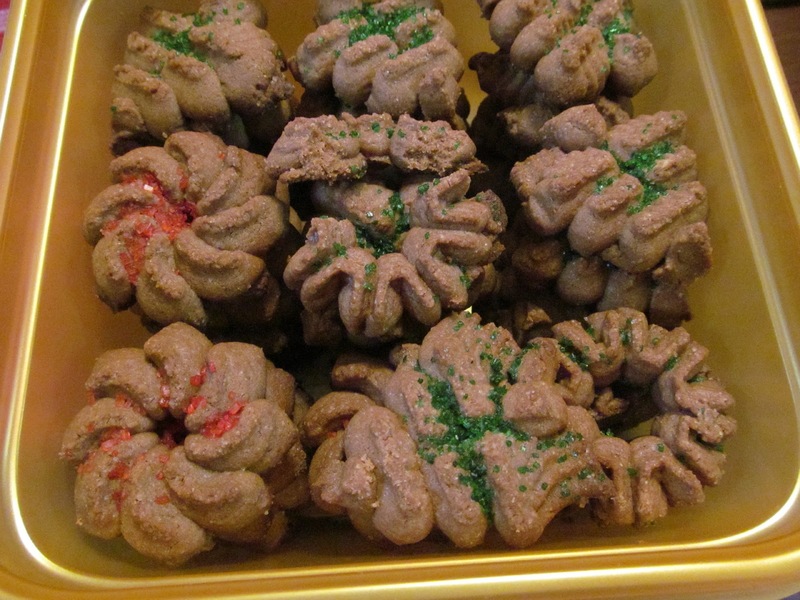 Last night I baked the first batch of chocolate Spritz cookies. They are all to go in the boxes I'm mailing. Then I have to make another batch for the family here. I need to do a batch of plain (not chocolate) Spritz this morning and then start packing boxes. Come get your tea I say to hubby several times a day. As the chief cook and bottle washer here, I try my best to serve him not only tasty meals, but nutritious ones. Sometimes though I think he would be just as happy with only bread, biscuits and bacon, his favourite B word foods washed down with lots of steeped for five minutes black tea. On the phone, my mother, who is days away from 85, asked me if I had my Christmas baking done. She loves to talk cooking and baking with me and laments how her kitchen days are behind her. She still speaks with surprise of how I don't bottle things because we are so alike and that was something she did often with food. Her reasoning being, if company dropped in, you always had something you could make a meal out of for them, the real Newfoundland way. Do you try to fit other things into your little container of yogurt? I do mainly because I don't want to dirty up a bowl which is ridiculous when you think about it especially with a dishwasher under the very counter I'm leaning on poking around in the yogurt. 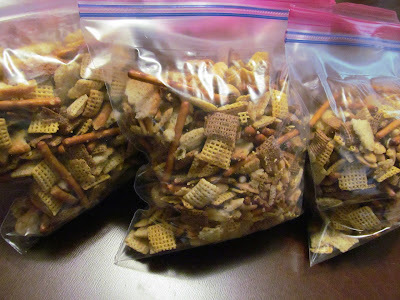 I try to put in bran buds, or dried cherries, or flax seeds depending on the day and mood. New to me is Icelandic Skyr yogurt available here as a President's Choice product and I like it. So many new products all the time! While wondering what I would write about this month, I googled "writing prompts" in various forms...SO helpful! One of them was, "Five places I would like to visit". I seem to be clicking a few local ones off my list but what about far off places? This isn't to say that these are the ONLY places I would like to go but they would be a great start. I am quite Irish and would love the country views and the weather! 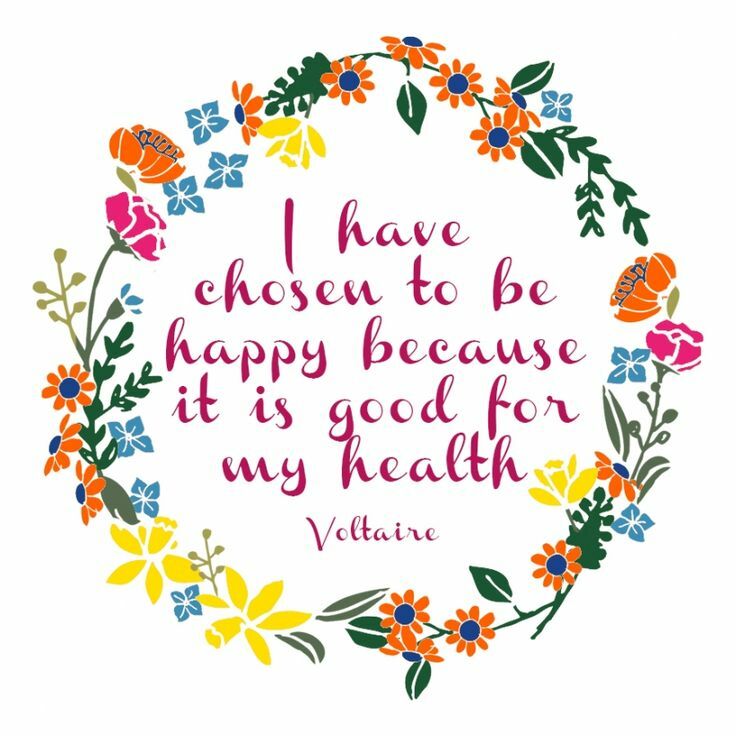 I like this saying and I think I had the fortitude to choose mostly, but I'm not sure everyone has that ability and certainly not all the time. For instance, last Tuesday I felt sad all day. No idea why, no reason that I could pinpoint, just mopey and teary with a feeling of weight on my mind. I went about my business as usual but felt like I was going through the motions, as it were. We had our Thanksgiving meal yesterday and the turkey was delicious. So was the ham and the apple pie and French silk pie, and all of the rest of the dishes on the menu. The little great-grandsons loved the variety too. Growing up we were not allowed to say we were bored...well not allowed is a little bit strong...encouraged not to say it would be more accurate. I have no memory of either parent ever really putting their foot down. We would always be pointed toward a book, our school work, go outside and play or hobbies if we ever looked like we needed something to do. I'm thankful for so many things all the time. I thank the Lord every night just for bringing me to this day. Thankful also doesn't even begin to describe my feelings at this time of year. I love autumn (even if ours was unseasonably warm and wet), and I love being able to have good times with my family (we're really lucky in that department). This year, though, I'm standing on the precipice of changes for myself and the Hubster, and it's making me see things in a new light. I would much rather be gardening outside but do have a patch for indoors this winter. I repotted and doubled up some of the plants and fingers crossed, will manage to not kill them in the long winter months ahead. It scratches my gardening itch to maintain these and fuss over them a little each day. I don't use fertilizer but may need to read up on it if the finicker ones are to survive. 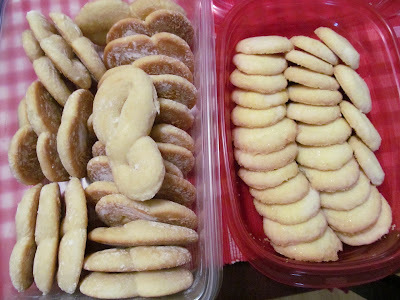 Yesterday I made Kringlas and shortbread cookies. Today I will make frosted creams, the family favorite dessert. That will be the end of the baking and then it is party time. 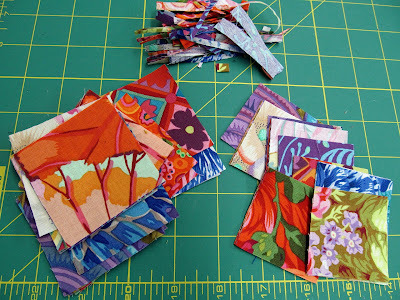 I am continuing to cut scraps into 2.5" and 2" squares with just little bits left to put in the dog bed stuffing bag. I am cutting some Brandon and Philip fabrics now to add to the Kaffe squares for another colorwash quilt. 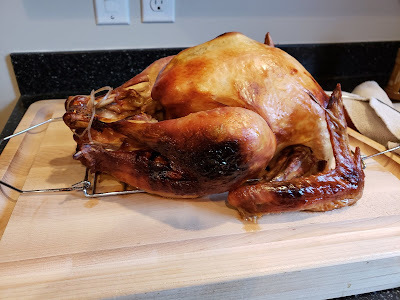 I get to make the fun stuff for the Thanksgiving get together. I started out yesteray with 3 batches of home made Chex Mix. 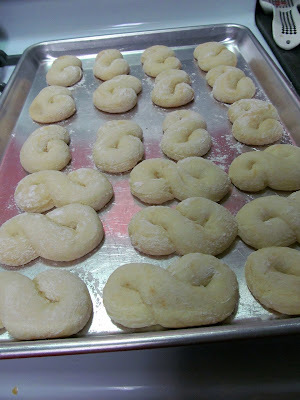 Next I mixed up the dough for Kringlas but it has to refrigerate for several hours so I'll bake those today. Then it was on to pumpkin muffins. The recipe says it would make 24 but the paper liners are so short that I got 27 out of the batch. I remember when the paper liners were taller and when it said to fill 3/4 full it used up all of the batter. This is one of the Mother trees on this property. Surviving for over a hundred years and still sending out leaves that turn this unique yellowish colour. This is a side of the house where the basement exit is that I've never shown you either...there is my outside compost bin on the lower left. This tree is visible from our bedroom window and produces quite a show all year round. The woodpeckers love it and all the blackened limbs when snow laden are beautiful too. 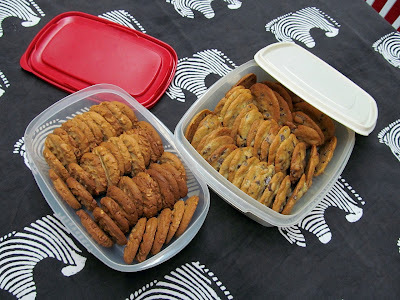 I got the last few things picked up and put away and baked the 2 batches of cookies. 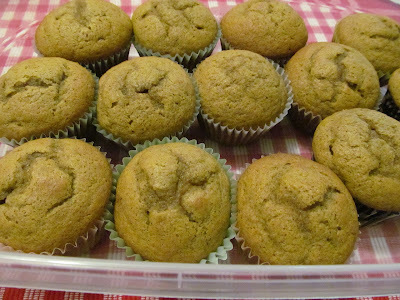 I have been eating less sugar so I hadn't baked for awhile. The cookies tasted sooooo good. I had to test them you know. My granddaughter came over and sewed for 4 hours yesterday working on gifts for her family. It was a fun day. White Eagle, you don't have an email link in your comment. You asked about the large rotary mats. Either email me directly or just do an internet search for 40" x 72" rotary cutting mat.